I love having flowers in the house. 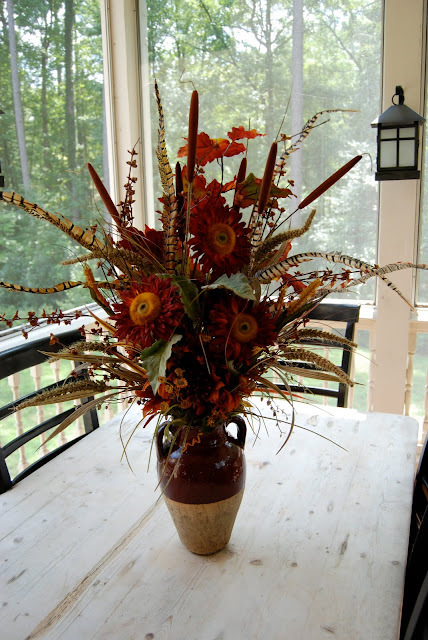 For years I was opposed to the notion of what I haughtily called "fake flowers." At some point I had decided that in my home, only fresh flowers would do, thank you very much. Which meant that I usually had NO flowers in my home. But I've learned something in the past year. "Fake flowers" have come a long way. 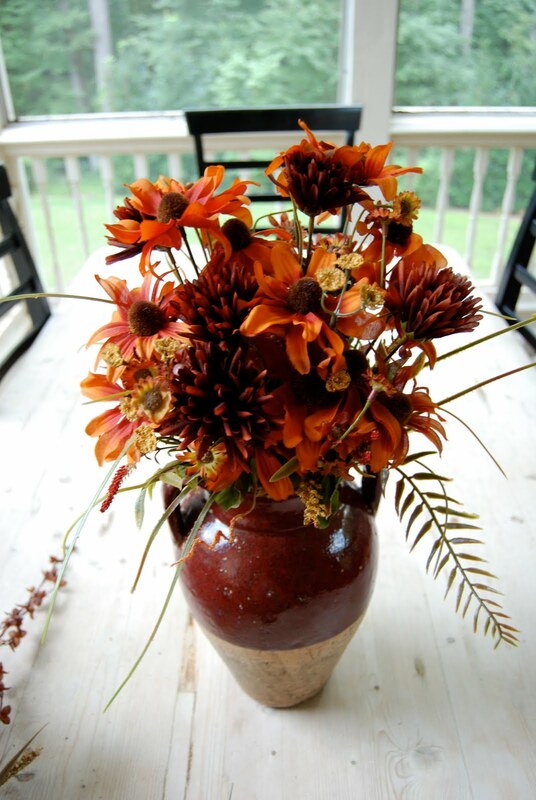 Beautiful silk and dried flowers are readily available, inexpensive, and really very pretty. In addition to that, they're so easy to work with! You know how easy it is to make a pretty bow with wired ribbon? The wire holds the ribbon just in the right position, so it's super-easy to work with. Well, that's the way silk flowers are. Wherever you put them, that's where they stay! Here's an arrangement I just made for the welcome table at church. The key is to get the plastic and wire "stems" down into the container so that nothing shows other than the pretty parts. Then I stick in some other tall elements, like these silk leaves and cat-tails. I usually have one tall element in the center and pairs of other elements, one on each side of the center, trying to keep things pretty symmetrical. Then I add my "star" flowers: usually three of some special, usually fairly large, flower. In this arrangement I used sunflowers. After those are in place, I stick in little filler pieces (in this case, wheat and feathers) on the sides, adding and subtracting and generally "fluffing" until the arrangement is as full as I want it. Since this arrangement is for the welcome table at church, it's pretty big--very tall and fairly full, so it requires quite a few flowers. I've purchased most of my silk flowers at Michael's and Hobby Lobby. If you buy them when they're on sale, you can put together even a big arrangement like this for $25 or less. and popped the whole deal into a pretty container. Voila! These will be pretty all season long . . . and then I can pack them away and use them again next fall! What about you? 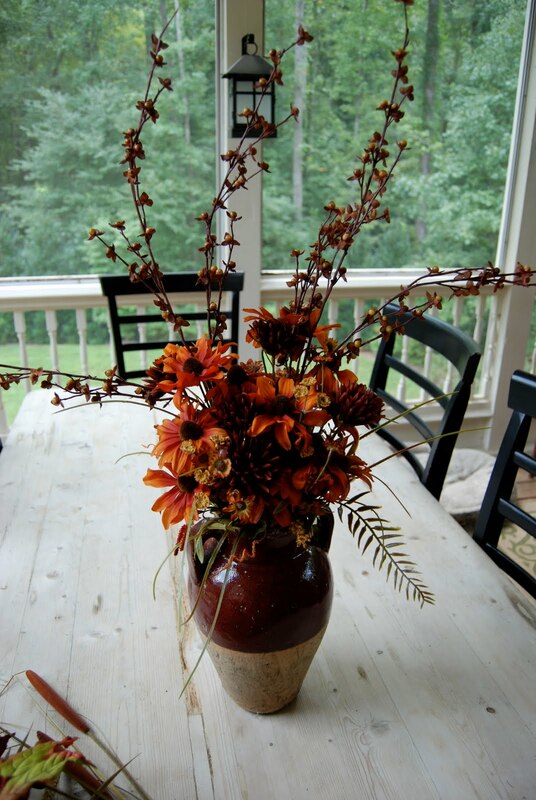 Do you like to decorate with flowers? Ever try silk flowers? Do you know any good tips for using them? Please share! --I'm linking up with Tabletop Tuesday at Marty's blog--hop over there for more inspiration! Very pretty flowers Richella! You created a lovely arrangement. I agree they have come a long way. We should use what makes us happy in our own homes. The storm was very mild here. Whew! I'm glad it's over. Now if only hurricane season was. Gorgeous!!! I love all the filler and tal stuff. I need more flowers in my house, too. Blessings! They are beautiful! I completely agree with you on the evolution of faux flowers. Yours are SO much better than the ones my Nannie used to keep around from the 70s. Blech. Great job!!! 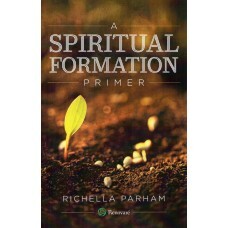 Looks lovely Richella! Good job! Your arrangements are beautiful. I love fresh flowers in my home but cannot have them due to my daughters allergies. So, this past year I have started to dabble a little bit with arranging silk flowers. It is so much fun and I love the uniqueness of each creation. Thank you for sharing your photos and have a blessed day! Your church flower arrangement is beautiful! 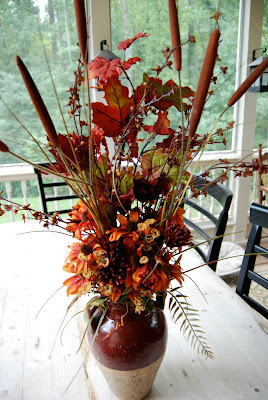 Just tonight, I was adding some fake fall arrangements around the house. The colors are so bright and beautiful, I love the warmth they add to my house. I have used a lot of fake flowers because I have never been able to afford the real stuff. AND the real stuff turned to dead stuff pretty quickly in my house. Lately, I have been trying to add a few fresh flowers, but it is rare, which makes it a treat! Tomorrow is my dad's first bday without Mom. Say a prayer. The whole family is coming to my house to celebrate his birthday and my Luke's birthday. Plus we are watching UK play Louisville in football! Huge rivalry around here! Should be a good distraction for Dad. Thanks for the step-by-step with pictures! Great job! Very pretty! A tip that I learned from my mom is incorporating silk flowers into a vase of fresh flowers to make it fuller. When the silk flower stems are coated in plastic, they don't rust in the water in the vase. Thanks for making it appear simple. I am all aghast when I look at my finished product. I've had people tell me if I could tie my shoes, I could make a beautiful bow. Oh, that it was true. You talented people don't know how hard it is for those of us without the knack. Keep teaching us, please! Very pretty arrangements. Richella! I love the deep colors and really appreciate the tutorial on how you fill the vases. I also LOVE the table that the 1sr arrangement was sitting on!! Oh! I love those beautiful flowers so colorful. I also try to collect flowers and put it in a cute vase. I enjoyed reading your article. It makes a lot of sense. Thanks for sharing. I would say it’s not at all bad to have fake flowers in your home, actually they are in trend these days and silk flowers are replacing real ones because of their durability, cost and long lasting nature. I am one of them as well who uses them to decorate my home and work places.